It was late on Day 7 of the 2014 World Series of Poker Main Event. 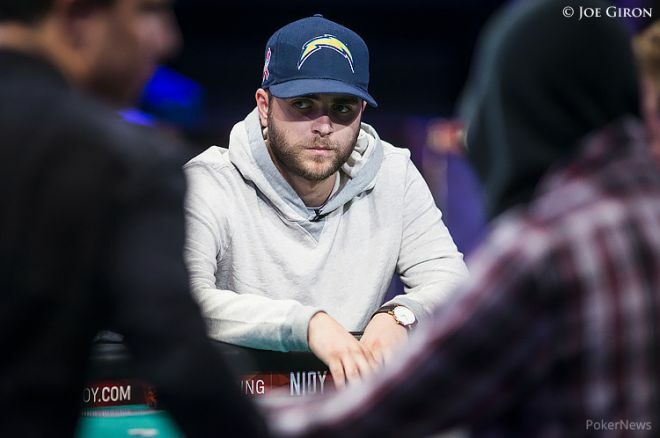 Felix Stephensen, an online poker pro from Norway, was sitting behind a chip stack of 15 million, placing him fifth out the remaining 15 players and only six spots away from the November Nine. With his every move under a microscope and the entire poker world watching, Stephensen had carefully and calculatingly climbed the leaderboard without putting his stack at risk of serious damage during the day. That quickly changed in Level 33. With the blinds at 120,000/240,000 and a 24,000 ante, Stephensen was sitting in the small blind when he peeked down at . As he waited for his turn to act, he watched a lot of action play out in front of him. First Mark Newhouse raised to 500,000 from middle position. Then Thomas Sarra Jr. called directly behind, and Bruno Politano called from the cutoff as well. When the action reached Stephensen he opted to reraise, pushing 2.25 million into the pot. The big bet forced a fold from Newhouse, but Sarra Jr. fired back with a four-bet to 6.7 million. Politano folded, and Stephensen suddenly faced the biggest poker decision of his life. We sat down with the Norwegian pro to get his thoughts on this critical moment and how the decision that followed helped secure his seat at the final table. PokerNews: This is obviously a huge hand that eventually boosts you into the chip lead with 14 players left in the Main Event. Talk us through it from the start. Stephensen: Well, I actually messed up the bet-sizing. I wanted to three-bet to 1.75 million but I went 500K too much. I guess it worked out (laughs). If I go to 1.75 million, [Sarra] probably folds. That’s interesting. So then Newhouse folds, and Sarra reraises to 6.7 million. What’s going through your mind? At this point I think we’re probably flipping in some way. Maybe even chopping. Tens, jacks, queens and ace-king seem like the most likely hands [for Sarra]. I can’t really fold either way — ace-king suited against some weird action, and I think he was steaming a little bit, too. He had recently lost a pretty big pot against [Luis Velador]. I thought it over for a few seconds and then jammed it in for just under 15 million. Obviously I was up against the nut hand for my ace-king. Right… Sarra calls and flips over the and you’ve got him dominated. Do you think he was priced in to call there? Yeah, I think he was. He only had like 6 million more — half of his stack. He’s obviously screwed when I jam because I’m going to have a really strong range there to get it in. I’d say ace-king is pretty close to the bottom of my range. I flopped a good hand and held up. Editor’s note: The board runs out , and Stephensen rakes in the biggest pot of the tournament to that point. Sarra is eliminated in 14th place. We heard Sarra tell someone that he was having a hard time keeping his eyes open late in the tournament. That may have even affected the way he played this hand. Did you have any problems dealing with fatigue? I’m pretty used to putting in long hours, but that’s mostly in front of the computer. I was obviously tired during that week — the setup is so intense. You get up at 10 or 11 a.m., try to get some breakfast, go play until 1 or 2 in the morning, and then I need an hour or two just to wind down. I couldn’t go directly to sleep afterwards. The days are really intense and you don’t get any time to get back on your feet. You just have to manage the entire way. What was your strategy going forward after you won the 25 million-chip pot against Sarra? Were you looking to coast into the November Nine or were you trying to build a big stack to have at the final table? I was planning to put some pressure on the shorter stacks. Looking back now I probably could have applied a bit more pressure, but it’s scary thinking about blowing up. I think I raised a lot of hands, but when we got down to 10 I got the worst table draw. I was second in chips but I had Jorryt [van Hoof], the chip leader, to my direct left. He’s pretty active and super good, and Newhouse was on his left. At that point I just decided to tighten up and get to November. I was hoping we had another redraw in November but apparently we don’t. Talk about that. How is this seat draw going to affect your play at the final table? You have to have respect for the bigger stack in tournaments, so I’m probably going to play a bit tighter than usual. But I’m not going to let Jorryt run me over, either. For more on Stephensen, check out his November Nine profile here at PokerNews. And be sure to watch for more November Nine strategy articles and interviews leading up to the final table!